Rice and chopsticks seem like a mismatch. 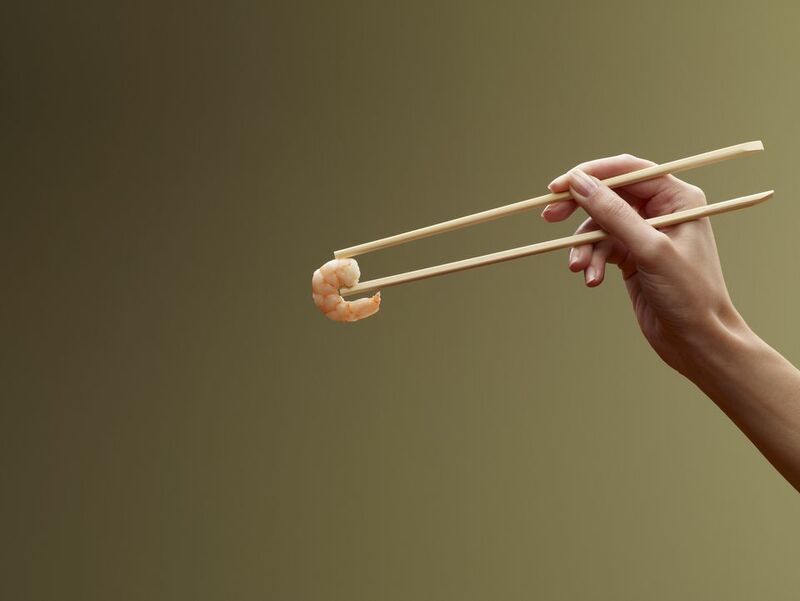 Using chopsticks to eat certain foods sometimes seems inconvenient and impractical, however, there are polite workarounds. A scoop-shaped spoon will sometimes accompany dishes that are difficult to enjoy with chopsticks. As usual, when traveling in Asia, locals understand that you may not know all their cultural caveats. You'll usually be forgiven for mistakes unless you really cause a loss of face. Watch what others are doing and follow their lead, particularly at formal banquets or when visiting someone's home in Asia. When taking a break, place your chopsticks in a tidy fashion to the right of your plate, preferably with the tips on the provided rest. Try not to point them in anyone's immediate direction. Watch out: Putting chopsticks on top of your bowl or plate indicates that you are finished and the staff may whisk it away! Particularly when eating in Japan, allow elders or senior members at the table to lift their chopsticks first. Don't noticeably pick through dishes for specific ingredients that happen to be your favorite. This applies when dipping from communal bowls or when eating from your own plate. Just eat and enjoy! Avoid crossing your chopsticks into an "X" — it symbolizes death in some cultures. Always keep them held in eating position or tidy, side by side, next to your plate. Put down your chopsticks while waiting for the next dish or not eating. At the end of the meal, place any disposable chopsticks back into the paper wrapper, and leave them to the right of your plate. Koreans use spoons to eat soups and sometimes rice. Always put your chopsticks to the right side of your spoon when resting on the table; the reverse is done at memorial dinners for deceased loved ones. Wooden chopsticks are less slippery for beginners than the plastic or metal versions, making them somewhat easier to handle. But there's a problem with snapping those wooden sticks apart every meal: The demand for disposable chopsticks far surpasses the ability to make them from wood scrap. Don't be fooled by the simplicity or small size — not all disposable chopsticks are made from scrap wood. An estimated 20 million mature trees are logged each year just to supply China with billions of throwaway chopsticks. That figure doesn't include the rest of the world! What's worse, many disposable chopsticks are made using toxic chemicals (industrial bleaches to make them pretty) which can leach out into food. Plastic and metal chopsticks, although a bit more slippery to use, are far better choices for traveling more responsibly. Watch Out: Those Disposable Chopsticks May Be Poisonous!